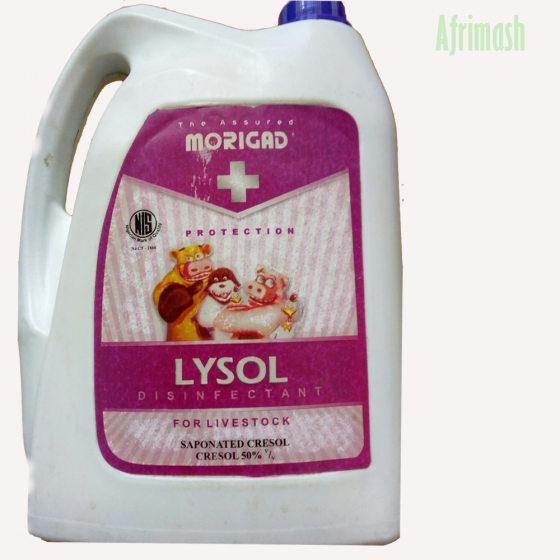 Morigad Lysol is an extremely powerful general-purpose disinfectant specifically suited for veterinary and livestock operations due to its high affinity for animal disease-causing agents implicated in conditions such as Brucellosis, Tuberculosis, and some other zoonotic diseases. Against Anthrax, African swine fever, Brucellosis, CBPP, and Glanders; dilute 1 part with 49 parts of water for animal dips. Against Tuberculosis, dilute 1 part with 39 parts of water for animal dips. Against Foot and Mouth disease, dilute 1 part with 9 parts of water for animal dips. For the prevention of disease outbreaks in a poultry farm, dilute 1 part with 39 parts of water for poultry farm and pen entrances. Dilute 1 part with 99 parts of water.